One of the most beautiful and inspiring creatures in the ocean is the orca, or killer whale. This month, I'd like to share with you a simple project that will be auctioned off for a charity event. 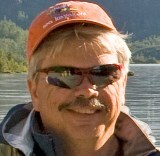 I started the project with two images found on the internet. 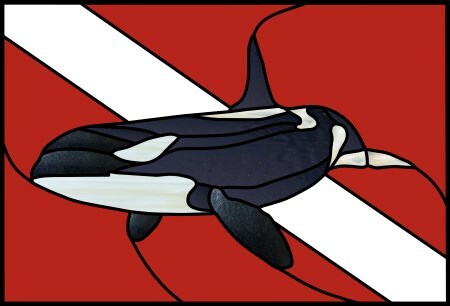 Using Photoshop, I superimposed the image of an orca on top of a classic scuba dive flag. I then added that image as a background into Glass Eye 2000. Next, I easily traced the lines in the image and then took a PDF of the design to Kinko's to have a full-size image printed. Using my low-tech light table (a sliding glass door!) I translated the image onto contact paper, and adhered the contact paper to the glass once the pieces were cut out. I use the same technique for all my projects because it saves me a lot of time in cutting and grinding. Often I can cut right on the line and not have to do any shaping with the grinder. This was a single-day project. Most of it I completed at my home studio, and finished it at Joe's Glass Shack in Escondido. I am donating this panel to the WAVES Project. It's a support group for veterans that uses scuba diving to help those who suffer from PTSD or have experienced grievous wounds while in combat. Studies by Johns Hopkins have demonstrated amazing results for wounded soldiers. In one study, after just four days of diving 100% of the participants experienced increases in neurologic function, equal to 6-12 months of task-based rehab. The same participants experienced 80-90% decrease in PTSD symptoms. I'm very happy with the way this panel turned out. 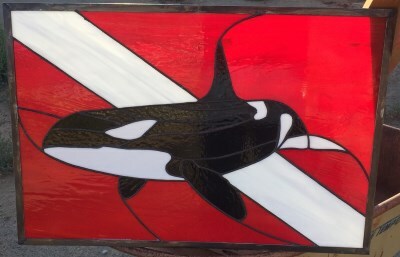 Being only my fourth stained glass project, I'm still getting the hang of it. Glass Eye 2000 sure helps a lot!